Will Knight, maker of collectibles and fine woodenware, noticed he had an abundance of spiders on his farm. Each spider wove it's own, individual web design. Will began collecting these webs and making unique web items from them. He also devised an ingenious method of encouraging the spiders to weave just for him. This is how he has become known affectionately as the Spiderwebman. Learn to appreciate nature at its finest. collected by Will Knight. 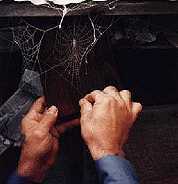 The colorless, fragile web of an orb-weaving spider called Araneidae is first brought to light by painting. It is then transferred by hand to a wooden plaque where it is protected with a fine furniture finish to assure a lifetime of enjoyment for all web lovers.